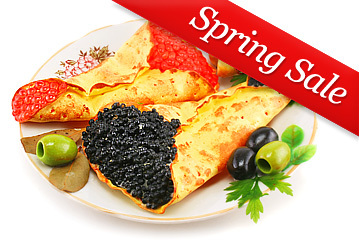 For years Awers Inc. has distributed Red Caviar only to wholesale suppliers and retail stores. Now, we are opening direct sales of our product to Red Caviar lovers everywhere. Awers Inc., located just east of Seattle, Washington, employs the traditional Russian expertise and technology that historically has produced the world's finest caviar. But unlike many Salmon Caviar suppliers, Awers Inc. also ensures that its product meets all FDA and USDA standards. We are able to proudly pass our Red Salmon Caviar along to you, our customers who have made Awers Inc. one of the largest Red Caviar distributors in the United States. World class quality caviar, which stands on par with the best sturgeon caviars on the market. Dont't miss out on this opportunity to treat yourself to such exquisite delicacy while our supply lasts. This product ships overnight via UPS, so it must be ordered separately from other products. Ships within 3 business days after receipt of order. The shipping charge for this product is $21 for any quantity. For shipping charges for other products see Shipping & Security page. This Sockeye salmon roe has small sized, red color eggs and a savory taste; some eggs may be broken or juice may exist. Kosher OU. This high-grade Alaskan Chum salmon roe has well-formed eggs, as well as a lightly salted, delicate taste. Kosher OU. Pink Salmon Caviar has medium size eggs, as well as a lightly salted, delicate taste, vacuum-packed tin, Kosher certified by OU. This high-grade Alaskan Coho salmon roe has well-formed eggs, as well as a lightly salted, delicate taste. Kosher Certified by the Orthodox Union. This Sockeye salmon roe has small sized, red color eggs and a savory taste; some eggs may be broken or juice may exist. Salmon Caviar, vacuum-packed jar with a tamper-proof seal, Kosher certified by OU. Our best Coho Salmon Caviar, vacuum-packed jar, Kosher certified by OU. This Sockeye salmon roe has small sized, red color eggs and a savory taste. Kosher Certified by the Orthodox Union. This premium grade, Chum Salmon Caviar has large, well formed, light orange eggs with delicate texture and refined taste. Sturgeon Caviar, Malosol. Vacuum-packed glass jar with a tamper-proof seal. Bowfin caviar is widely used in Europe as a less expensive substitute for sturgeon caviar. Russian Sturgeon Caviar, Malosol. PASTEURIZED, vacuum-packed glass jar with a tamper-proof seal. This is a unique and wholesome product with a delicate taste. Using technology developed by Awers and all-natural ingredients, we produce the Caviar Spread by whipping wild Pacific Ocean salmon caviar with vegetable oil containing no hydrogenated or partially hydrogenated fats. Caviar has long since been considered a simple yet exquisite delicacy, appropriate for celebrations along with a glass of fine champagne. Yet Salmon Caviar, also known as Red Caviar, is much more than a fancy treat to be savored only on special occasions. Red Caviar can be served as a garnish or as a savory appetizer, for both elegant and everyday meals. In addition to possessing a delicate and exquisite taste, Red Caviar is also a hit with the health-conscious. Red Caviar is an excellent source of DHA and EPA, the very Omega-3 acids that work to prevent heart disease, blindness, depression, premature birth and play an essential role in the healthy development of one's brain and eyes.